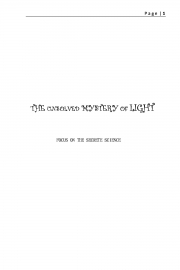 Description of "THE UNSOLVED MYSTERY OF LIGHT (eBook)"
Hay! Writing a book is not just prints of hundreds of pages but it is the talent and contribution of the writer to give its knowledge to the others. Book writing is carried out from early 9th century and will go till end of human because it is the real way to express someone’s thought from soul. Many scientists have had worked for theory on light and wear successful and helped in development in humans. Today the most developed things use the technique of EM radiation. Because this is one of the topic which made humans mind work for a long period of time. “Human is a political animal”, this lines are true and because of this nature we so our interest only on the thing which is profitable to us and this is why we know the property of radiation but not the origin. This book makes clear about every property of EM radiation, not which are found in every next book but everything new on practical basis. The book is not the boring history of radiation but focuses only on the mysteries of light and because of it this book is clear and short. As it is told that the book is fully on the practical basis so some of the complicated characters are theoretically solved. As this is my first book in the age of 17 and my hard work of 1 year. The objective of writing this book is not the money but let all of us know the thrown property of light in more details. The book manly focuses on particle / photon of light. Reviews of "THE UNSOLVED MYSTERY OF LIGHT (eBook)"